Everybody has a bucket list. Whether they admit it or not they at the very least have a mental list of things that they would like to do someday. Seeing Iron Maiden in concert is probably something that should be on every concertgoers list. They are heavy metal pioneers and have have continued to be trendsetters for decades now. They have the most brilliant branding that any band has ever had with their mascot Eddie adorning shirts, cups, posters, coasters and tons of other merchandise. The greatest part about having the clout of being Iron Maiden may be that they can get a huge band like Megadeth to play second fiddle and open for them, as was the case for the Kansas City show at The Sprint Center on September 7th. Thousands of shirts all brandishing the red Iron Maiden logo with some form of the group’s decomposing mascot would fill every isle of the large venue as some of the most faithful and devout fans in the music world would get ready to see the ageing rockers. It had been several years since the group graced a stage in the city so it was a given for 10,000 plus fans to fill the seats. 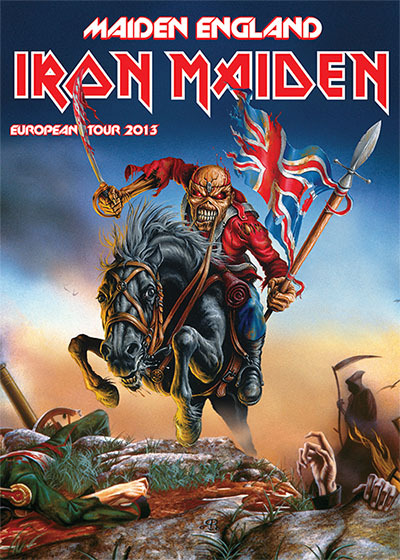 The Maiden England tour poster that would extend to the United States. Megadeth would take the stage first and hit it hard, starting out by running to their positions on stage. Lead singer Dave Mustaine would start by bellowing out the thrashy “Hangar 18.” The vocals on the first 2-3 songs would sound muddied and buried by would clear up by the time the group would change pace with the great “Sweating Bullets.” Mustaine would introduce the group’s newest song performed “Kingmaker” but not say a whole lot else in between songs until the end of their set. Long, exuberant guitar solos would heavily decorate the set, making it a good thing that the sound for the set was a very good mix after the first couple songs. By the time the group took on “Tornado of Souls” they had hit their stride and were firing on all cylinders. The two guitarists and bass player would commonly swap spots in front of the three microphones on stage, occasionally several times during the same song. Mustaine would even sing lead vocals on all three different mics, a rarity for a live show. The head-banging set would conclude with “Holy Wars… The Punishment Due” and a shower of unused guitar pics would rain over the crowd. Mustaine would be the last one off of the stage after a long and seemingly sincere thank you and goodbye to the crowd. The deep stage contained several tarps and covers for what would be unveiled during the Iron Maiden set that was up next. A “U” shaped scaffold surrounded the stage and was draped in a ice themed set of covers to match the groups short introduction video with ice avalanches. Lead singer Bruce Dickinson would emerge on top of the scaffold which he would litter with footsteps throughout the night and tear into “Moonchild.” The opening song that has remained how the group starts shows for the last couple years but seemed to be not the greatest lead-off tune. 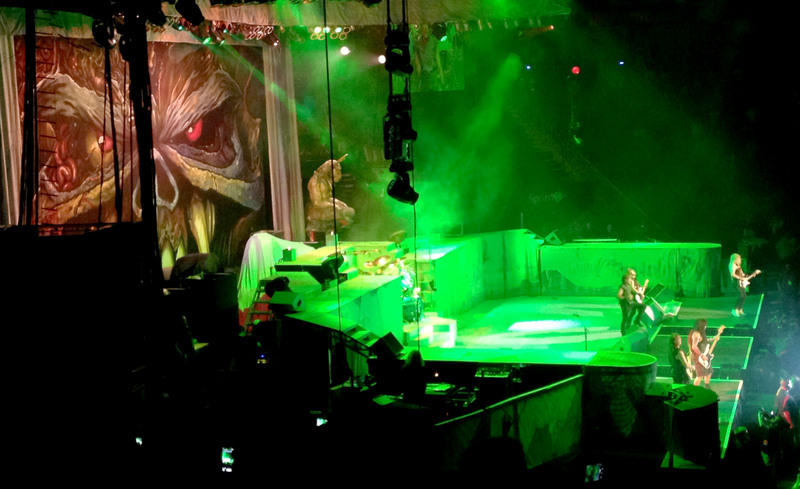 British rockers Iron Maiden put on a massive show at The Sprint Center in Kansas City, Missouri on 9/7/13. The second song “Can I Play With Madness” would then prove to be one of the best of the night as Dickinson would launch himself off the top of the monitors on the front of the stage toward the crowd. The 55 year old singer would be shockingly active and animated for the whole nearly two hour set by the metal pioneers. He would often retire behind the scaffold to rest during long solos and instrumental parts of songs. He would even appear to be a little bit sick at times behind the stage but would properly recharge his batteries every time he would come into view of most of the 10,000 plus fans. Dickinson would commit the most common of errors during the show, calling the crowd “Kansas” despite being in Missouri, an understandable mistake in a border town but still took just a bit away from the performance as one of his trademarks is yelling “Scream for me ______.” Some of the impact of this is taken away when you are being called by the wrong name and nearly everybody knows it except the band. Iron Maiden brainchild Steve Harris would play bass in his signature fashion along side guitarists Dave Murray, Adrian Smith and Janick Gers all moving around the stage frequently while Nicko McBrain would be stuck behind the drum kit. The group would play what could be described as a “greatest hits” set, hitting many of the high points of their career including the massive “The Trooper” and “Run To The Hills.” It would be about 4 songs in before Eddie would make his first appearance but after he was introduced he would frequent nearly every song in some form. A giant robotic Eddie comes out on stage to try to get members of Iron Maiden at The Sprint Center in Kansas City on 9/7/13. The group performs the same set at all their show for the last couple years and after the props were introduced you could see why as giant backdrops and various props would be used in order. “Fear of the Dark” would get a massive response from the crowd while “Phantom of the Opera” would stretch on for a little long with its lengthy instrumental break. The main set closer “Iron Maiden” reminded everyone that once Maiden could have been called a punk band way back in the day and the short encore break would end with a ferocious “Aces High” that would see Dickinson don a leather aviator hat. The last song Maiden would perform on the night (and maybe forever in Kansas City) would be the anthem of anthems; “Running Free,” which would see the packed area all singing in unison as a fitting sendoff for the British rockers. The show had a classic feel before it ever started. Maybe it wasn’t the actual performance on the night but it was, in-fact, seeing history. Iron Maiden will no doubt always be one of the most important bands of all time in their genre. Megadeth is not exactly a nobody opening band either, the combination is possibly one of the best pairings to share a metal show bill. It was really an instant “I was there” experience. Something that won’t soon be forgotten and will certainly be bragged about for quite some time by all in attendance, plus, it’s one more thing off my bucket list. This entry was posted in Concert Review and tagged Aces High, Adrian Smith, arena, backdrop, Bruce Dickinson, bucket list, concert review, Dave Murray, Dave Mustaine, Eddie, heavy metal, Iron Maiden, Janick Gers, Kansas, Kansas City, Megadeth, Missouri, Nicko McBrian, Running Free, setlist, Sprint Center, stage show. Bookmark the permalink. Thank you Kim, I didn’t pay close attention to the time but Megadeth went on a couple minutes before 8:00 and Iron Maiden was done about 10:45 to 11:00 I think. The show was an hour and 50 minutes give or take. Megadeth started right at 7:30, and they played for an hour. Iron Maiden started right at 9pm.